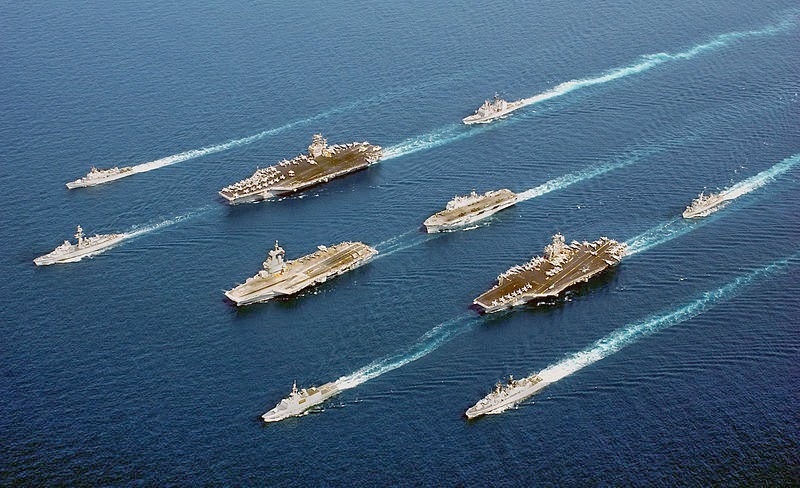 EagleSpeak: On Midrats 23 Feb 14, Episode 216: "Maritime Strategy and Control of the Seas with Seth Cropsey"
On Midrats 23 Feb 14, Episode 216: "Maritime Strategy and Control of the Seas with Seth Cropsey"
What direction do we need to go for our next maritime strategy? Using the recent article, Control of the Seas, as our starting point, our guest for the full hour will be Seth Cropsey, Senior Fellow and director of Hudson Institute's Center for American Seapower. He served in government at the Defense Department as Assistant to the SECDEF Caspar Weinberger and then as Deputy Undersecretary of the Navy in the Reagan and Bush administrations, where he was responsible for the Navy’s position on efforts to reorganize DoD, development of the maritime strategy, the Navy’s academic institutions, naval special operations, and burden-sharing with NATO allies. In the Bush administration, Cropsey moved to OSD to become acting assistant secretary, and then principal deputy assistant SECDEF for Special Operations and Low-Intensity Conflict. During the period that preceded the collapse of the USSR—from 1982 to 1984—Cropsey directed the editorial policy of the Voice of America on the Solidarity movement in Poland, Soviet treatment of dissidents, and other issues. Returning to public diplomacy in 2002 as director of the US government’s International Broadcasting Bureau, Cropsey supervised the agency as successful efforts were undertaken to increase radio and television broadcasting to the Muslim world. Cropsey’s work in the private sector includes reporting for Fortune magazine and as a visiting fellow at the American Enterprise Institute, and as director of the Heritage Foundation’s Asia Studies Center from 1991-94. His articles have been published in the Wall Street Journal, The Weekly Standard, Foreign Affairs, Commentary magazine, RealClear World, and others. Join us live or pick up the show later by clicking here.